You might call it the great recycling paradox: As curbside recycling programs proliferated across the United States in the late 1990s, overall recycling rates for beverage containers actually dropped. The high-water mark for beverage container recycling, it turns out, was 20 years ago, in 1992, when 54 percent of cans and bottles were recycled, according to the Container Recycling Institute, a nonprofit organization that advocates for comprehensive recycling of packaging materials. Since 1992, according to CRI, the overall recycling rate for beverage containers has plummeted and now only a third of beverage cans and bottles are recycled. Recycling rates crashed even as the number of curbside recycling programs in the United States swelled from about 2,700 in 1990 to more than 9,700 ten years later, according to BioCycle magazine. Blame the paradox on increased consumption of canned and bottled beverages, often in public spaces where recycling programs don’t reach. The upsurge in consumption is partly the result of population growth. More surprising, perhaps, is a jump in annual per-capita consumption of canned and bottled beverages in recent decades – from 319 in 1980 to 721 in 2006, according to CRI. 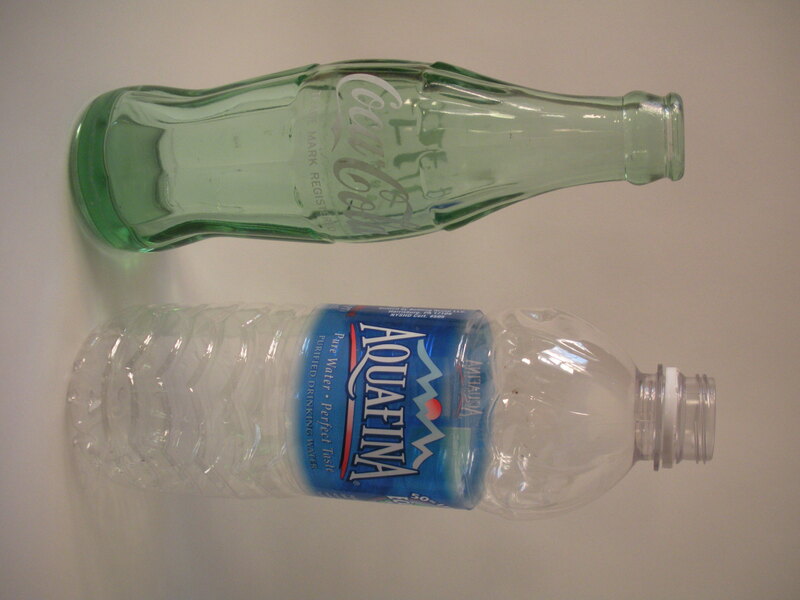 Almost all of the per-capita increase can be traced to the bottled-water mania of recent years, led by such brands as Coca-Cola’s Dasani and Nestlé Waters’ Poland Spring. Consumption of bottled water leaped from about 3.2 billion gallons in 1995 to 8.75 billion gallons in 2010, according to Beverage Marketing Corp., a consulting and financial-services firm. That translates into a lot of bottles; annual sales of plastic water bottles rose from fewer than 3 billion in 1996 to nearly 36 billion in 2006. As more Americans chug more canned and bottled drinks, overall recycling rates haven’t kept pace. Industry figures show that only 29 percent of plastic bottles are recycled. Glass beer bottles and glass soft-drink bottles collected by municipalities are recycled at the rate of 41.4 percent, while the rate for wine and liquor bottles is even lower, at 24.7 percent, according to the U.S. Environmental Protection Agency. The one relative bright spot is the recycling rate for aluminum cans, which pushed past 58 percent in 2010, according to industry figures. CRI reports that aluminum cans account for about half of all beverage containers sold. As low as reported recycling rates are, CRI argues that most are inflated because they don’t take into account important factors such as contamination of recycled containers. Lackluster recycling rates aren’t just a theoretical issue for eco-nerds to debate. Their impact is seen every day in the litter soiling our communities and washing into streams and rivers. During last April’s annual Potomac River Watershed Cleanup, volunteers collected 519 bags of recyclable cans and bottles from 36 sites along Rock Creek and its tributaries in the District of Columbia and Montgomery County, according to Beth Mullin, executive director of the Rock Creek Conservancy. The deluge of beverage containers into the creek has continued despite curbside recycling programs adopted by Montgomery County in 1991, followed by D.C. in 1998. The number of beverage containers washing into streams can surge following heavy rainfall, as occurred in early September 2008 when the remnants of a tropical storm swept through the Washington area. A week later, volunteers from the Izaak Walton League reported that bottles and cans comprised three-quarters of the debris they collected from Bull Run. After the April 2011 cleanup, the Alice Ferguson Foundation announced that volunteers had removed a total of 48.4 tons of recyclable glass, aluminum and plastic bottles from the Potomac River watershed, which covers D.C., Maryland, Virginia, and two other states. Keep in mind, it’s an annual watershed cleanup, so expect a similar figure in April, after another year of litter washing into the Potomac and its tributaries. “A lot of beverage containers are consumed away from home . . . so curbside recycling is only a partial solution,” said CRI’s executive director, Susan Collins, at last October’s annual Potomac Watershed Trash Summit in Arlington. The summit, which brings together public officials and environmentalists, is organized by the Alice Ferguson Foundation to further its goal of a “trash-free Potomac” by 2013. Collins’ group is promoting an idea that was trendy back in the 1970s and 1980s, but has since been eclipsed, in the public mind, by curbside recycling programs: beverage container deposit laws, commonly known as “bottle bills.” Eleven states have enacted bottle bills, led by Oregon in 1971. Delaware repealed its law in 2010 in favor of statewide curbside recycling, leaving 10 states with bottle bills in effect. States with beverage container deposit laws show much higher recycling rates, according to CRI. In a study based on 2006 data, CRI found that the overall recycling rate of beverage containers was 61.4 percent in states with deposit laws, compared to 24.2 percent elsewhere. When it comes to recycling, money speaks louder than eco-ethics: Michigan’s 10-cent deposit is the highest in the nation, and nearly 97 percent of deposits are redeemed, suggesting that Michigan has the nation’s best recycling rate, even assuming that some cans and bottles come from outside the state for illegal redemption. States with beverage container deposits also report substantial reductions in litter. New York’s Department of Environmental Conservation, for example, describes that state’s 30-year-old bottle bill as “a tremendous success” that has reduced roadside container litter by 70 percent. Longtime residents of the District of Columbia will recall a hotly contested, and ultimately unsuccessful, attempt in 1986-87 to enact a D.C. beverage container deposit law. Appearing on the ballot in November 1987 following a petition drive, the measure was defeated by a vote of 55 percent to 45 percent. Proponents of the D.C. bottle bill were blindsided by ferocious pushback from a coalition of beverage producers and distributors, container manufacturers, and retailers both large and small. The industry coalition spent nearly $2.3 million to defeat the proposed bottle bill, an unheard of amount at the time. The money bought not only television and radio ads, direct mail, and telephone calls, but also an army of paid ward and precinct workers. Deliberately or not, the industry campaign drew strength from longstanding racial and economic fault lines within D.C., faint echoes of which were heard in 2009 during the successful effort to enact a 5-cent fee on disposable bags. The industry’s core argument was that beverage container deposits would burden consumers ̶ especially the low-income and elderly ̶ with higher costs and inconvenience. Retailers also worried about the burden of storing dirty used containers and losing business to nearby jurisdictions that had no deposit laws. Industry arguments against the bottle bill eventually were echoed by key players in D.C.’s political establishment, including city council members, the local chapter of the NAACP, and a group of 130 ministers. Proponents of the bill countered that a deposit law would not only reduce litter in the city but also create hundreds of jobs in the recycling industry. ● After 14 years or more of curbside recycling in the Washington area, it is clear that such an approach does not address the problem of beverage container litter in public space away from people’s homes and businesses. Deposit laws are an essential part of a comprehensive solution to litter. ● The beverage container deposit laws in 10 states have matured, been tweaked by legislatures, and proven both their worth and practicality. For example, to mitigate retailers’ concerns, most states with deposit laws now use a system of special recycling centers, either alone or in combination with retailers, to accept used beverage containers. There are even “reverse vending machines” in some locales that accept and crush empty cans and plastic bottles for pickup from retail stores. Nearly 200 elected officials in the Washington area have signed the Alice Ferguson Foundation’s “Potomac River Watershed Trash Treaty” in the past seven years, thereby pledging to implement trash-reduction strategies. Enacting beverage container deposit laws would be one way to show they mean it. To be sure, the defeat of D.C.’s bottle bill 25 years ago offers some sobering lessons, chief among them that grassroots organizing at the neighborhood level is essential to building support for a deposit law. Retailer concerns must be addressed, and region-wide beverage container deposit laws are preferable to piecemeal adoption by individual jurisdictions. More than two decades after D.C. voters rejected a bottle bill, its appeal to fundamental fairness in public policy is an idea worth recycling. 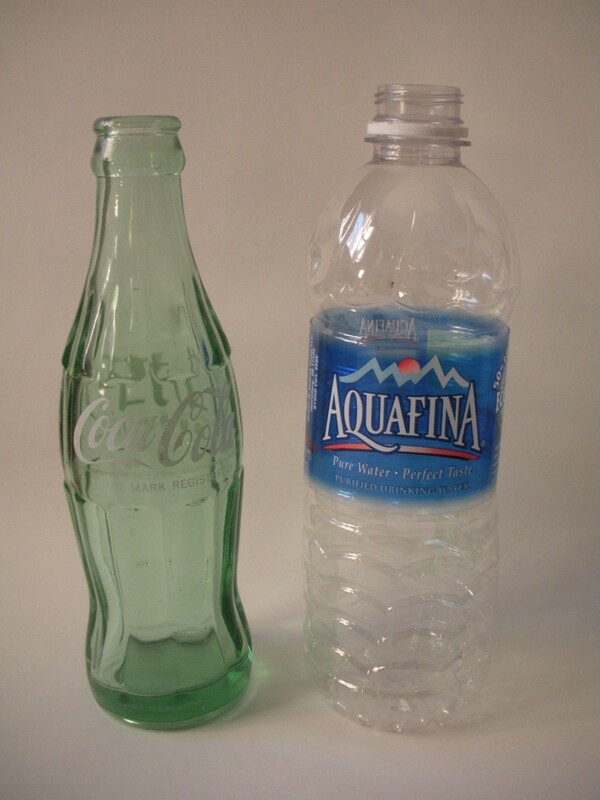 Update (June 25, 2013): D.C. Mayor Vincent Gray’s Sustainable DC Plan includes, as one of its ambitious goals, introduction of a container-deposit law for all glass and plastic bottles. (See Action 1.4 in the plan, which is available at www.sustainable.dc.gov/finalplan). Wayne Savage is the owner of Mid-Atlantic Litter Cleanup Service, a Washington-based public space litter-removal company. He participated as a volunteer in the Potomac River Watershed Cleanup in 2012 and 2013. This entry was posted in Beverage container deposit laws and tagged Alice Ferguson Foundation, Beverage Marketing Corp., bottle bills, Container Recycling Institute, D.C. Department of the Environment, Environmental Protection Agency, Izaak Walton League, New York Department of Environmental Conservation, Potomac River Watershed Trash Treaty, reverse vending machines, Rock Creek Conservancy by Wayne Savage. Bookmark the permalink.